Untitled, c. 1970. The Tokyo Monorail line opened in 1964 to coincide with the 1964 Summer Olympics. 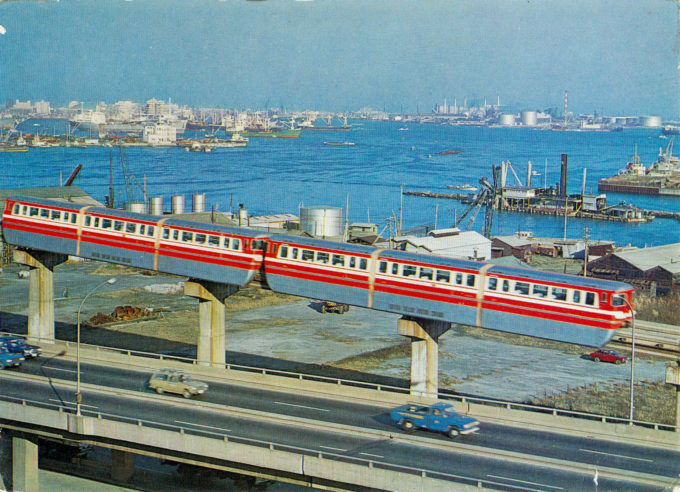 Originally, the monorail only served Hamamatsucho and Haneda International Airport. The first station added in between was the Ōi Race Track in 1965, followed by Seibijō in 1967. “Tokyo will have the world’s first extensive monorail network which will soon criss-cross the city, turning it into a futuristic metropolis where commuters will be whisked across town at tree-top level in a matter of minutes. With a small beginning Tokyo has already become the first city – in the world – to adopt the monorail for mass urban transportation. 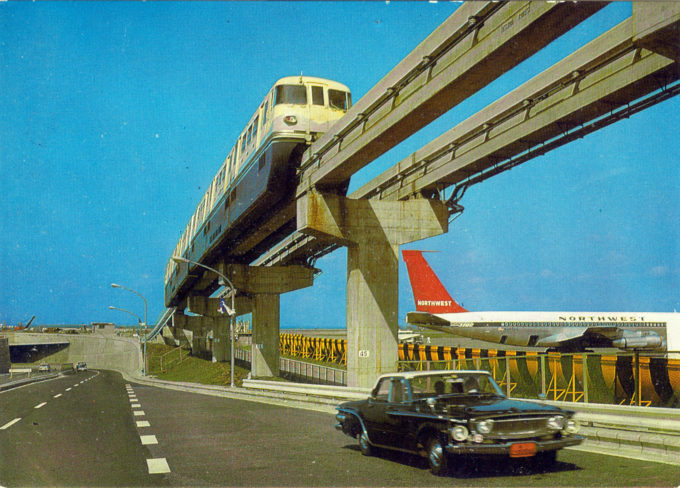 “… The distance between Tokyo International Airport and the city centre was cut to a great extent when a double track monorail was inaugurated in September last year (1964) by the Tokyo Monorail Company. [It] was completed in a short period of sixteen months with a cost of 19,600 million yen. Its type is called the Hitachi-Alweg system or the straddle system. The pneumatic rubber wheels of the monorail train roll astride the ferro-concrete track beam. This device gives passengers a comfortable and safe ride. 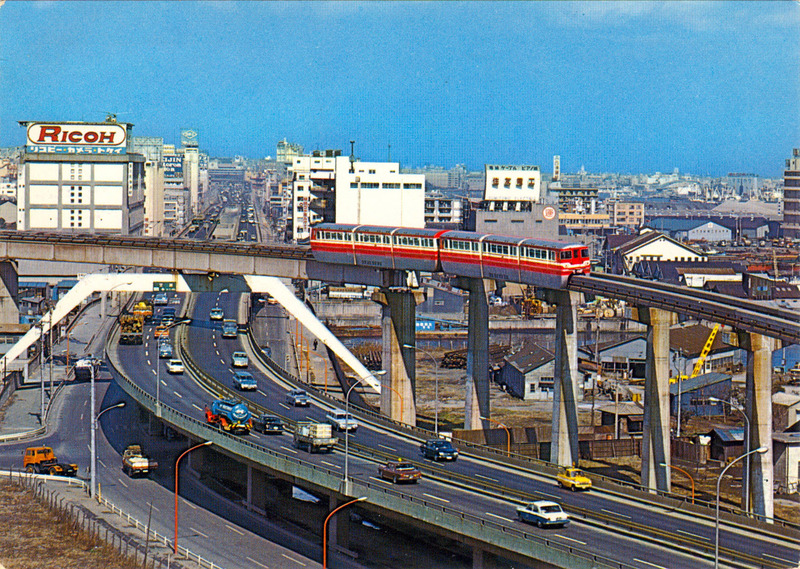 Tokyo Monorail departing Haneda (Tokyo International) Airport, c. 1965. A Northwest Airlines “travel” postcard. In the foreground is a 1962 Plymouth Fury sporting an orange US diplomatic license plate. 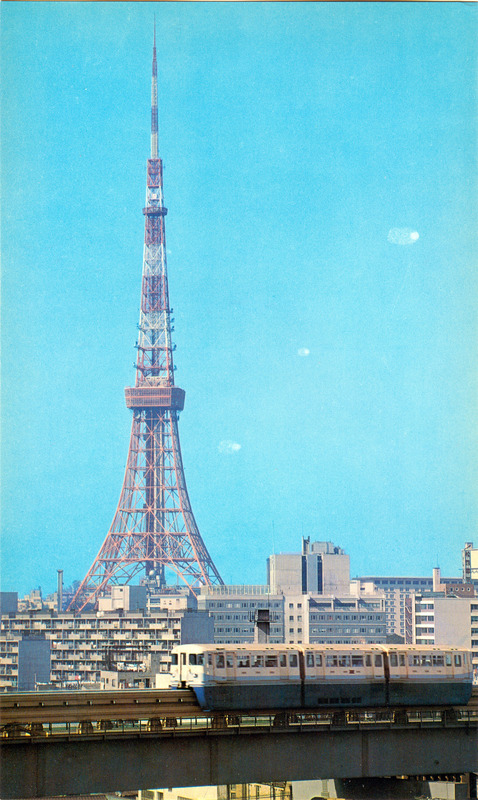 Tokyo Tower and Tokyo Monorail, c. 1965. Monorails were a futuristic mass transit concept designed to use urban air space and leave the ground to vehicular traffic. The first permanent monorail was put into operation as part of Disneyland’s theme park, in 1956, followed in 1957 by the opening of a short monorail track at Tokyo’s Ueno Park. Seattle constructed a monorail for use during its 1962 World’s Fair. But, the first large-scale commercial application of the monorail concept anywhere in the world was completed in time for the 1964 Summer Olympic Games in Tokyo, moving people from the city center to Haneda International Airport, one of a series of Olympics-related public works projects that ‘announced’ to the world of Japan’s coming-of-age. At the time of its completion, two weeks before the opening of the Games, the Tokyo Monorail was the longest in the world: 8 miles. By 1980, the Tokyo Monorail was ferrying more than 2 million passengers per month. The line was originally planned to extend from Haneda to Shimbashi or Tokyo stations. Cost overruns for the national railway’s Tokaido Shinkansen project shortened the monorail route. As a cost-saving move, the route was built largely over water with the elevated track following the coast line. The resulting construction eliminated a number of fishing and aquatic farming operations. In particular, the Omori no nori sea field in Ota Ward at Shinagawa, which had produced a premium brand of nori [seaweed] since the Edo Period, was destroyed.